The Fort stands as a symbol of the British rule, facing the sea It is the first British fort build around1653 by the British East India Company. The structure of the fort is a fine example of 17th century British military architecture, built in 1966. It has a 20 feet thick wall. It has the country's tallest flagstaff is over 300 years old. The 24 black Charnockite pillars are those reclaimed by the British in 1762 of the original 32 which once formed the colonnade of the present Secretariat building. Within the fort, a number of other early buildings still stand of which St. Mary's Church is the most interesting. It was consecrated in 1680 and is the oldest Protestant Church in the East. The church contains several antiquities, not the least being the oldest British tombstones in India and memories of weddings in which Clive and Elihu Yale, benefactor of America's Yale University, Arthur Wellesley who became Wellington and Warren Hastings were present for weddings held here. Opposite the Church is the Pay accounts office. It was formerly Robert Clive's house commemorates the Empire-builder who first learnt his trade here. It is open to the public. Other buildings of importance in the Fort are the Old Government House, the Banqueting Hall (now called Rajaji Hall) built by Golding ham for the Governor's official entertainment during the Clive period. The foundations of Indian Army and Civil Service, the land survey by Colin Mackenzie, and the archaeological, botanical and zoological surveys were all laid at Fort. St.George. 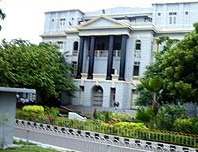 Now Fort St. George houses Tamilnadu Secretariat and the Legislative Assembly.